Upon admission, our social worker guides new residents and their families through the adjustment process by providing support, information and orientation to the home. The primary focus of the social worker is to facilitate the new resident’s comfort and emotional well-being during this life transition and to provide ongoing support and advocacy throughout their stay. 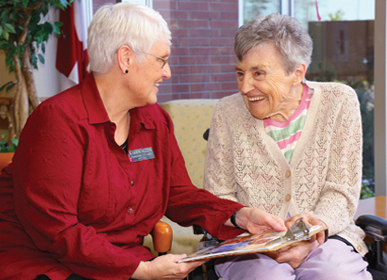 At McCormick Home, we provide social work support to residents and their families to help them not only through the transition to long-term care, but also for ongoing support throughout their time with us. We recognize that health and well-being is best achieved by not only attending to physical or medical needs but also by addressing the emotional needs of those in our care.